What’s a cow’s favorite skincare product? Moo-sturizer. We all have a guy in our world who would laugh at his own cheesy dad jokes just like this one. You know what’s no joke? Men that take care of their skin and body. Anjou has a product no matter what he’s dealing with –dry skin, oily skin, a rough beard, back acne, dry hands, or muscle pain– and you can bet it’s man-approved. Below are some ideas to delight your dad: personal care and soothing solutions. Need a fast solution? Gift cards online are always convenient for both parties! We’ve selected some hardworking products for men — “For Him” stickers are on products we recommend! Slippers, dry brushes, beard-care, skincare, CBD pain relief . . .
Like the Eminence Stone Crop Hydrating Mist – a few spritzes of this directly on his face and his skin will be ready to take on the day. This product is a no-fuss toner and moisturizer and a perfect “gateway” skin care product for the man that needs a push in the right direction. And what are those lovely slippers? From our favorite Japanese-made store Morihata, these plush but lightweight Lana Room slippers are great for warmer weather; the high-quality cotton woven on looms allows the skin to breathe but wraps their feet in comfort. For the outdoor enthusiast, don’t forget to apply sunscreen! Protect that skin with Suntegrity mineral SPF. To care for aging skin, apply Eminence Stone Crop Moisturizer (Eminences’ top seller for men across the board), which will do double duty to reduce redness and irritation (i.e. wind or water damage from all that outdoor adventuring). Give dad a chance to try some of these products and take a load off with the June Special at Anjou Spa, the “King For A Day” 90-min massage that includes a pre-massage foot soak! Here’s another gift available in the Welcome Boutique that doesn’t have anything to do with skin – but lots to do with dads – a fancy steel flask that he can tote anywhere. 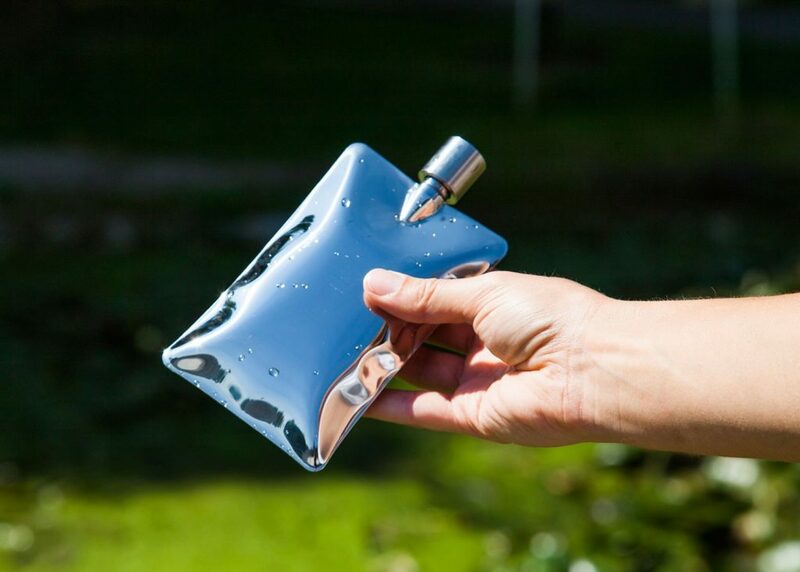 Areaware flasks are uniquely shaped through hydroforming two sheets of stainless steel, that are welded together and then inflated with water pressure. Science dads will get a kick out of bragging about this flask to their buddies while passing it around. And when he’s ready to let the day melt away and relax, he can rip into an empower gift set that includes topical relief lotion, soaking salt and one topical trial size. Visit the Welcome Boutique for more just for him CBD products like soothing Magsoothium CBD cream, and a lightweight, yet hardworking serum by Made by Hemp that will moisturize and protect his skin. For the ultimate manly relaxing experience, peruse our Men’s Treatment Menu and book something today. We’ll make your purchase “gift-ready” when you walk out the door, another bonus to shop for Dad at Anjou! Always an easy, but thoughtful gift, Gift Cards Online! Purchase on our website and either print or email the gift card for them.